Written by CEMB on April 25, 2019 . Posted in Featured, Press Releases. 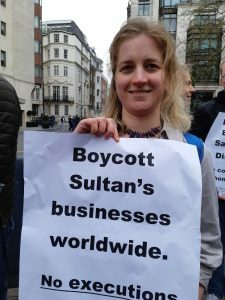 In the past years, Council of Ex-Muslims of Britain has held fast-defying protests at embassies in solidarity with those who are persecuted for eating and drinking during Ramadan. personal story told by an ex-Muslim every day for the month of Ramadan. The 17 May protest at the Department for Education aims to highlight the Department’s inaction with regards to child fasting in schools. Child fasting should be banned as it is harmful to children. If a child was sent to school without breakfast and not allowed to eat lunch or drink water whilst going about their normal school day for an entire month, this would rightly trigger safeguarding procedures and be considered a form of neglect. However, when it comes to children of religious parents, the Department for Education readily turns a blind eye. Being forced to not eat or drink water for an entire month for 12+ hours a day is clearly harmful to children and child development. It causes sickness, dizziness, migraines, sunstrokes, lack of focus and tiredness as a result of dehydration or lack of sustenance. It also can lead to depression, anxiety, mood swings, irritability, anger, apathy, reduced alertness, diminished comprehension… Children have been known to faint as have teachers who are fasting. Adults, of course, can fast if they choose. It’s important to remember that there is a corresponding right NOT to fast if one chooses not to. Nonetheless, when it comes to children, imposing fasting rules is child abuse and neglect. The Department for Education has a duty of care for school children and must act immediately to put child welfare above religious demands of the child’s parents. We are outraged at the Islamist attacks on churches and hotels in Sri Lanka. Our hearts go out to the survivors and victims – 359 killed, including at least 45 children, and more than 500 wounded. We mourn them with the people of Sri Lanka and the world. The terrorists claim to have killed innocent Christians and others in order to “avenge” innocent Muslims killed in Christchurch; the Christchurch terrorist also feigned to kill innocent Muslim worshippers as an act of “vengeance”. What should by now be very clear to everyone is that these terrorist attacks have nothing to do with addressing grievances – real or imagined – and everything to do with using terror, hate, supremacy and violence as a tool to impose the ideology and dominance of the religious-Right. 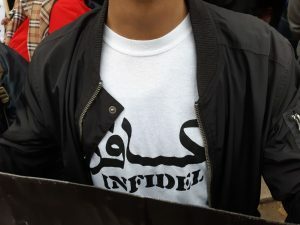 Whether Islamist or white nationalist, whether in Sri Lanka or Christchurch, these far-Right movements have no respect for human life and rights: Christian, Muslim, ex-Muslim, believer or non, white, black or brown, young or old; no amount of murder or mayhem is too heinous for their hateful cause. Always anti- those deemed “other”; always relying on hate, religion, violence, misogyny, homophobia, tribalism, xenophobia, anti-Semitism and terrorism to sow fear and division. For too long and still far too many continue to excuse one side over the other depending on where they stand. Some will defend the Islamists, others will defend the Christian-Right, both sides saying there are “legitimate grievances” even if they claim to abhor terrorism. Many will even go so far as to blame the victims, especially in the case of apostates and blasphemers like Charlie Hebdo or the Bangladeshi bloggers. What these apologists fail to see is that there is no legitimisation for murder. Those killed in Sri Lanka could be any of us. We could be next. We must all take an unequivocal stand against all forms of fascism and hate. We must not allow the conflation of the religious-Right with ordinary believers, victim blaming, and the dehumanisation of the “other” to legitimate a politics of terror and hate. Sooner than later, we must recognise that we are all in this together against the far-Right and in defence of our common humanity. Our lives and our rights are interlinked irrespective of our backgrounds and beliefs. It is a matter of urgency that governments stop appeasing theocracies and the religious-Right, including via faith schools and child indoctrination, religious courts and faith-based policies. This only strengthens divisions and the religious-Right. Defending secularism, citizenship and universal rights is the only way forward. Written by CEMB on April 24, 2019 . Posted in Featured, Press Releases. 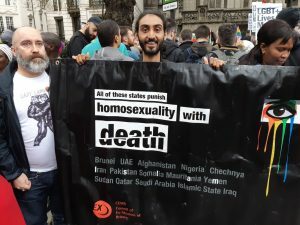 Council of Ex-Muslims of Britain (CEMB) has fought hard to take part in Gay Pride after the East London Mosque and Mend (Islamist bodies) filed official complaints in 2017 with Pride for our ‘Islamophobic’ placards. It took Pride 8 months to finally allow us to march again in 2018 after we stressed the importance of normalising blasphemy when one can be killed for it. Since our first participation in Pride, we have worked hard to explain the difference between apostasy/blasphemy and bigotry, to show how minorities within minorities have the right to think and live differently, highlight how homophobia is a pillar of the Islamist movement and that LGBT rights are intrinsically linked to the rights of other minorities, like ex-Muslims and women. We have also tried to reach out to Muslim LGBT groups. We understand very well the similarities between LGBT Muslims and LGBT ex-Muslims. Both face the same backlash from family and community. LGBT Muslims are ostracised due to their sexuality and LGBT ex-Muslims are disowned for both the sexuality and their apostasy. Also, CEMB works with a large number of refugees and asylum seekers, all of whom are apostates and some of whom are LGBT. 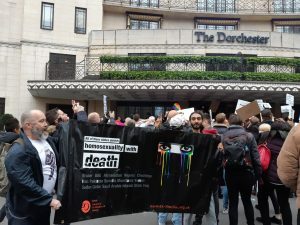 Pride is particularly important to our members as one of the few public spaces where ex-Muslim and gay members can openly assert themselves without fear. 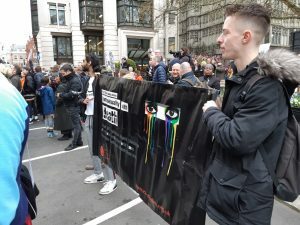 Our work is particularly important given the recent religious justification of homophobia at the Parkfield school in Birmingham and the new stoning sentence for homosexual in Brunei. CEMB is the only group that is critical of Islamic homophobia, focuses on the death penalty in Islamic states, and attempts to normalise and celebrate LGBT rights as well as apostasy and blasphemy. This year, in July 2019, CEMB will hold a panel discussion bringing together both Muslim and Ex-Muslim speakers to talk about LGBT rights, apostasy and blasphemy. It will be an evening of film, poetry and raise important questions that are matters of life and death for many of us. We will also be marching again in Gay Pride. Both the evening event and Pride march will help us highlight the existence of both Muslim and apostate LGBT and will assert the human right to live as we choose, without threats, shunning or persecution. The funds raise via this crowdfunding page will go towards the organising of the evening LGBT event, including a panel discussion, film screening and poetry. Costs include venue costs, travel and accommodation of speakers and security costs. The funds will also help us establish an exhibition of our iconic actions in defence of gay rights and apostasy, which will be shown at the event. The funds will also enable us to take part in the London Pride parade and funds raised will be put towards the cost of the application to take part in the parade, placards and banners, props and outfits for those taking part and more. 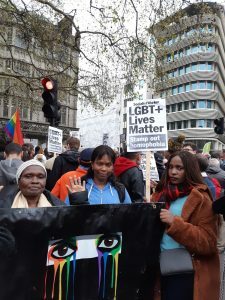 Our work for LGBT month will help to further the rights of ex-Muslims and LGBT, build bridges between Muslims and ex-Muslims and normalising blasphemy and apostasy. Thank you so much for those of you who are able to donate; without you we will not be able to carry out our important work, which makes such a difference to the lives of those forced to suffer in silence or forced to live in the closet – be that the LGBT closet, or the apostasy closet. Council of Ex-Muslims of Britain (CEMB) is both a support service and a campaigning group for the right of individuals that have left Islam. We exist because apostates from Islam, blasphemers and atheists are executed in a large number of Islamic states. Their only crime being to think for themselves. The very same states, and more – 15 to be exact – also punish homosexuality with the death penalty. Brunei’s new law punishes homosexuality with death by stoning. This, along with protests by fundamentalists in the UK to shun and vilify LGBT and ex-Muslims stresses the importance of our continued defence of the rights of LGBT and ex-Muslims whose lives and rights are intrinsically linked. 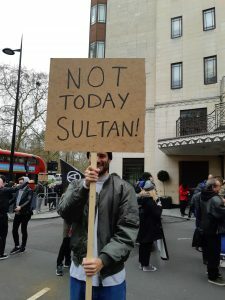 Our demand is simple. Equality for all. Individuals ahead of ideas.